Looking for nonprofit marketing books? 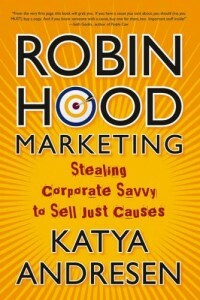 Start with Katya Andresen’s Robin Hood Marketing: Stealing Corporate Savvy to Sell Just Causes. In the spirit of Robin Hood, the book is about “stealing corporate know-how and applying it to good causes.” Andresen explains ten proven marketing principles—such as get people to do something specific, create a strong competitive position—and walks you through how to use each one to help your cause. …We talked about how to change his marketing approach according to these insights. He ended up making a slight change in his message that made an enormous difference in its meaning. The new approach (in rough translation): “You decide your future, or your babushka will do it for you. Vote on October 31.” Because of the work of hundreds of such organizations and an increasingly involved and engaged citizenry, some 80 percent of Ukrainians went to the polls during that historic 2004 election. Plenty of babushkas were at the polls, but so were many young people. Miller begins with the realities of today’s nonprofit world and a succinct overview of marketing (my experience is that most nonprofit marketers didn’t major in business). Then, while using the time-tested basics of traditional marketing, Leroux Miller takes you step-by-step through how to make a “quick and dirty” marketing plan, cutting through much of the hoopla to get what you actually need. Identifying the audience, honing the message, telling the story and creating the marketing channels—all told from the perspective of someone who’s lived it and been around it with many colleagues. The next section is the importance of (and how-to) building a community of supporters. And the final on is on how to do it yourself without doing yourself in. The entire book is as helpful as advertised: High-impact, low-cost ways to build support for your good cause. 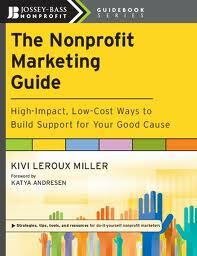 Kivi Leroux Miller’s website: Nonprofit Marketing Guide with a blog, frequent webinars, e-books (including How to Write a Nonprofit Annual Report). All practical, tested information.